We provide a comprehensive range of professional, high standard consultancy services in the North West. Our consultancy services are an integral part of the TreeStation, and are delivered in compliance with our values and to the highest environmental and safety standards. We work with our customers throughout the project, from quoting and surveying, to report writing and treework team managing. Our Principal Consultant Paul Hodgson is also our Arboricultural Manager, allowing for seamless transition from assessment to actual work on the ground, should you choose to hire the TreeStation for both. Who provide our consultancy services? Paul has a wealth of experience from which to draw upon when making day to day decisions regarding arboricultural management in both domestic and commercial work, and providing expert input into any reports of professional advice prepared by us. Any survey or consultancy advice prepared for your project will be checked and approved by Paul before being issues as a formal document. More information on Paul’s background and professional memberships here. 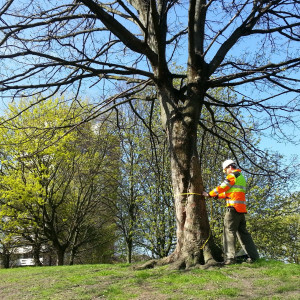 Sam Turner, who works alongside Paul, is a qualified arboriculturist, and has previous surveying and consultancy experience from employment as an arboricultural consultant in Leeds. More information on Sam’s background and professional memberships here. Tree safety surveys – Tree owners have a duty of care under the Occupiers Liability Act to prevent, as much as is reasonably foreseeable, injury/damage to person/property being caused by the trees in their ownership. This duty can be discharged by having trees inspected by a suitably qualified and experienced individual. We can provide tree safety surveys with a report detailing any issues found and with recommendations for the future management of the tree stock. In case corrective action needs taking, we will advise on what treework operations are required in an impartial and cost-effective way. A successful Tree Health & Safety survey discharges the customer of their legal duty of care, which means they are not liable in case of accident or damage. Most importantly, our advice is covered by our Professional Indemnity insurance policy. Tree surveys for home buyers – We will visit the property considered for mortgage, and provide a report on foreseeable tree maintenance and associated costs, as well as potential tree-related structural issues. We will discuss in detail any specific concern you may have, and will provide a quick turn-around, as we realise purchasing a house is a fast-moving and stressful situation. BS 5837:2012 surveys – If you are planning construction works and there are trees on or close by to your site then you will need to take into account the above and below ground constraints posed by the trees (these may be outside of your ownership). The key consideration for this type of works is the “Root Protection Area” – this is an exclusion zone created around the base of the trees on site and is directly related to the stem diameter of the trees in question. Under British Standard 5837:2012 Trees in Relation to Design, Demolition & Construction – Recommendations, you will need to calculate these areas and take them into account during your design process (as well as a number of other tree related factors). This is applicable from individual house extensions right the way up to large scale infrastructure projects. We have experience of working with developers, planners, architects and landscape architects and appreciate how time critical many of the milestones associated with these works can be. Therefore early investment in a competent consultant can really pay off in time and efficiency savings later on. Extension/landscaping close to protected trees – If you are planning some work close to trees protected under Tree Preservation Orders or Conservation Area legislation, you must take steps to protect them, even if the work you want to undertake doesn’t require planning permission. For information relating to planning permissions, see below. See our dedicated sections for consultancy services regarding woodland management/forestry , ecological surveys and landscaping.